Possibly every athlete’s dream supplement – Activeman® Oatein puts two powerhouse ingredients into one delicious, easy-to-mix shake. The combination of slow-release carbs from Scottish oats and high quality whey protein creates a satisfying and nutritious meal that maintains your energy levels, keeps hunger at bay and refuels your muscles. 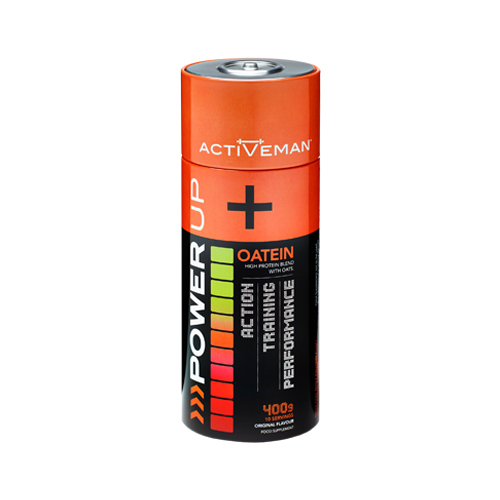 Activeman® Oatein can be enjoyed any time as a shake or in a smoothie. Have it for breakfast to fuel your day, before workouts to energise your session, or use it afterwards for muscle recovery. In every 40g serving, you get 20g protein, 36g slow-release low GI carbs, 1.8g fibre and 292 calories. It’s another high performance supplement from the Activeman® range. A sportsman’s two favourite nutrients, oats and whey, are now together in one delicious shake. Activeman® Oatein gives you all the goodness of Scottish rolled oats, supplying slow-burning complex carbohydrates, heart-healthy beta glucan and hunger-beating fibre. You also get a heavyweight portion of whey protein, which is easily digested and provides impressive amounts of BCAAs to help your muscles repair and grow. Our 100% natural Oatein combines the benefits of these nutritional champions in a smooth, tasty shake that’s quick to make. Each serving packs in 20g of whey protein and as much fibre as a bowl of oatmeal. As you expect from a Bio-Synergy brand, Activeman® Oatein is free of artificial flavours, sweeteners and colours. Best of all, you can enjoy Oatein at any time of the day – it’s great for breakfast, after workouts and whenever you’re looking for an on-the-go meal. Activeman® was developed alongside three-time Olympic gold-medallist, James Cracknell. IS OATEIN RIGHT FOR YOU? If you live an active lifestyle, and spend time working out rather than in the kitchen, Activeman® Oatein is the ideal way to get in a nutritious breakfast or snack. As you’ve read above, Oatein is made from Scottish rolled oats to provide you with complex carbs for all-day energy, as well as whey protein to fuel your muscles. It’s the perfect on-the-go meal that can fill you from breakfast till lunch. We’ve got you covered with a wide range of other performance products: Activeman® Energy Charge, Skinny Protein®, Whey Better®, Whey Hey®, Activeman Thermolean® and Vegan Lean&Green®. We’ve sourced the finest quality oats from Scotland and whey from grass-fed cows to achieve a premium quality content that is hard to match. As with all products made by Bio-Synergy, Activeman® Oatein is produced right here in the UK, so you know you’re getting the finest quality supplements. Rolled Oats, Whey Protein (Milk), Whey Protein Concentrate (Milk). Add 1 serving (40g scoop) to 300ml of semi skimmed milk or a milk alternative. For an even tastier snack, try adding a banana or some honey. "Great way to start the day and so versatile as well, can be used so many different ways! Can't get much better than protein and low GI carbs for breakfast. James"